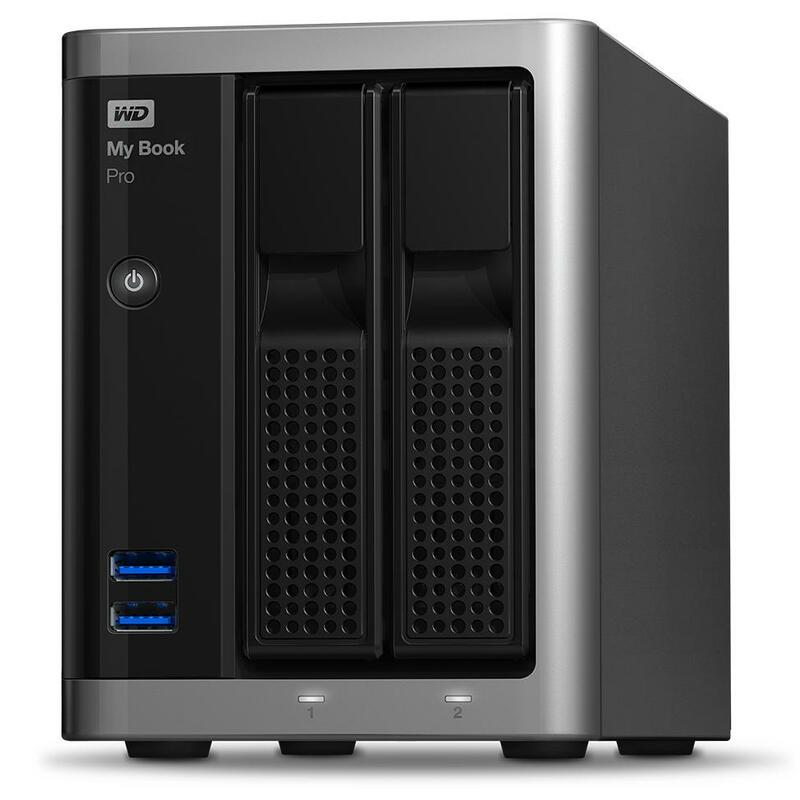 WD Astounds with My Book Pro professional RAID and My Passport Ultra! 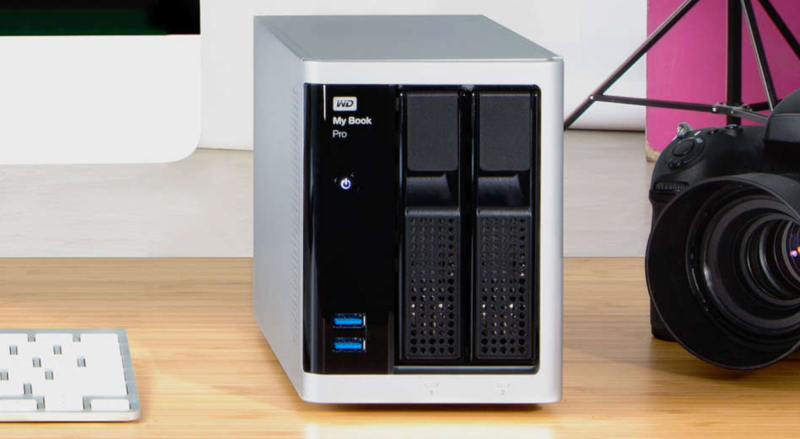 It’s no secret we’re big fans of Western Digital here at GYGO, which is why when we heard about their fantastic My Book Pro professional RAID system and new look My Passport Range, we simply couldn’t wait to check them out! First up we had a chance to fully check out WD’s incredible My Book Pro Raid System, which carries a phenomenal tech spec. With up to 16TB of storage and ultrafast transfer rates. This incredible piece of kit is evidently aimed at the professional creative. Formatted for Mac OS X the My Book Pro aims to help creative pros store large media files quickly and effectively via it’s Raid processing system. Because of this you know there’s little chance of data stalling and absolutely no chance of your computer’s CPU taking a hit from heavy transfers of files. Something which is essential for creatives who know your workflow won’t be affected by transfers. Straight out of the box it’s fair to say the My Book Pro is an absolutely stunning piece of kit. Under a very sleek aesthetic of a 147mm x 216mm silver casing, the My Book Pro houses the spectacularly fast interface of dual drives which are easily replaced. Something which is absolutely priceless for the creative professional who needs to ensure they have their files at their fingertips quickly. On top of which the RAID system can be customisable into three settings. 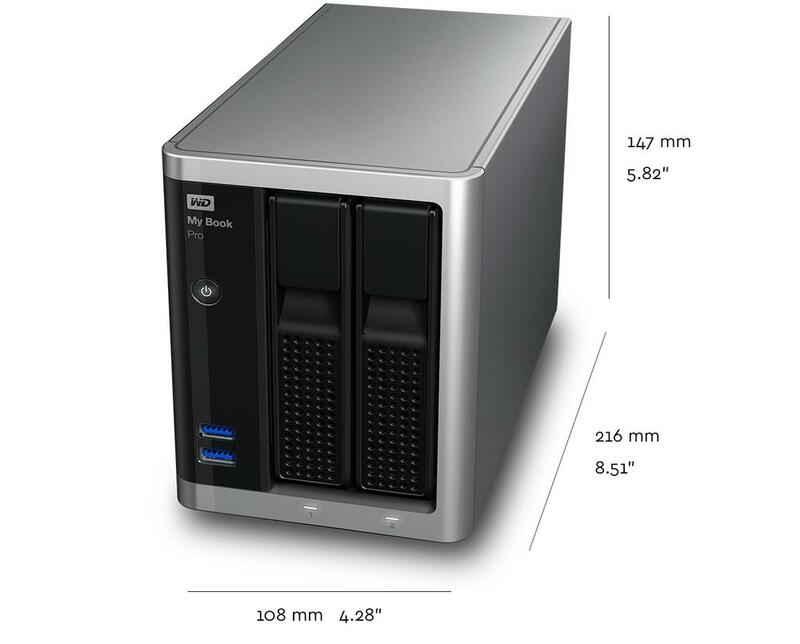 The First (RAID 0) allowing for maximum capacity of the drive and a faster performance. The second (RAID 1) allowing for a dual backup where one drive will automatically duplicate your first drive in case of a failure. Lastly JBOD (Where individual drives will function separately). This system is handy if you’re simply looking to boost your storage space and maintain an easy workflow with your hard drive system. The customisation is a great demonstration of WD’s consideration to it’s users and something we particularly liked. We were also impressed with the simplicity of the installation process. Carrying WD’s standard ease of installation, within minutes we were set up and ready to get started. In terms of connectivity the drives come with the blisteringly fast Mac specific Thunderbolt 2 along with the standard USB 3.0. The latter is absolutely fantastic for plugging in media devices such as cameras, directly into the storage device itself. It should be said the drives can be reformatted for PC use, however if you’re looking to get the most out of this kit, then you’ll want to be running it via a Mac, with USB 3.0 only able to transfer data up to 480 Mb/s. The system itself comes in at three levels of capacity 10TB, 12TB, 16TB so whatever your needs you know you’ll have the capacity to suit. We were lucky enough to check out the 16TB system which was more than enough space for us to get to grips with some heavy media moving. We were blown away by the speed the My Book Pro runs at. The Raid system is incredibly fast and efficient for moving larger scale media files. We really put it through it’s paces by pushing it with several heavy movie files, which were processed and then transferred. The My Passport Pro made mincemeat of them, quickly speeding through the transfer process with no noticeable slow down to our overall CPU. Which, as any creative professional will tell you, is invaluable when you’re up against a tight deadline. On top of which if you’re looking to extend your storage capabilities you can take things further and daisy chain up to six Thunderbolt storage devices. This evidently will maximise your workflow and make accessing files across several systems even faster than via a standard hard drive connected workflow. All in we were absolutely blown away by both the functionality and aesthetics of the My Book Pro Raid Syste. It carries the signature sleek design of WD and at the same time is a phenomenally powerful and fast piece of kit. Which is future proofed to ensure you won’t be looking to update your storage systems for a very long time. Highly recommended. 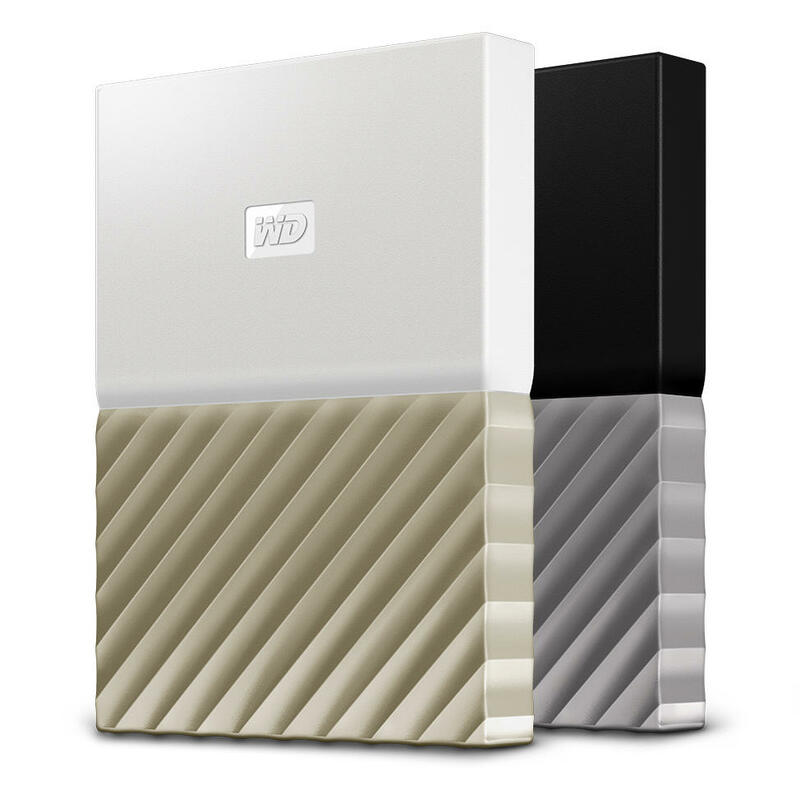 Make sure you get yours today direct from WD at https://www.wdc.com/products/external-storage/my-book-pro.html#! Next up we had a chance to check out the simply gorgeous looking new line of WD My Passport Ultra drives. Western Digital’s line of My Passport Ultra drives are well known for their durability for travelling with. Not to mention their impressive three year limited warranty. Their plug and play accessibility makes things especially easy for users to move and transfer files quickly and when they need to most. We’ve loved the previous incarnations of the My Passport Ultra so were looking forward to this new variation in the classic range. It’s reasonable to say we hadn’t expected quite what a great step forward it would be. 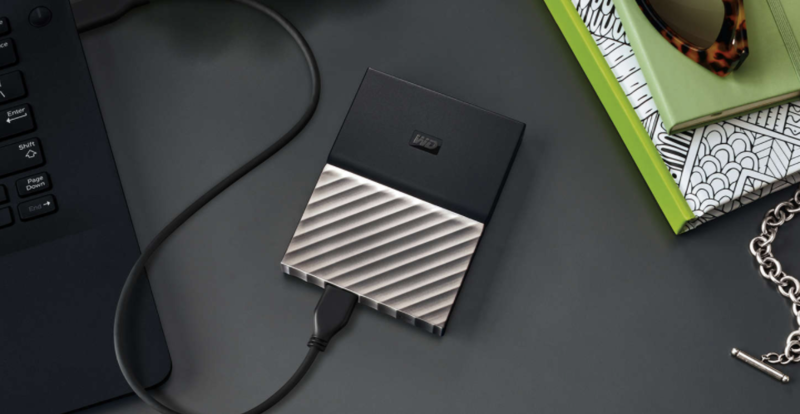 WD’s new My Passport Ultra drive carries a sleek metallic and matte finish which really adds an air of distinction to their drives. 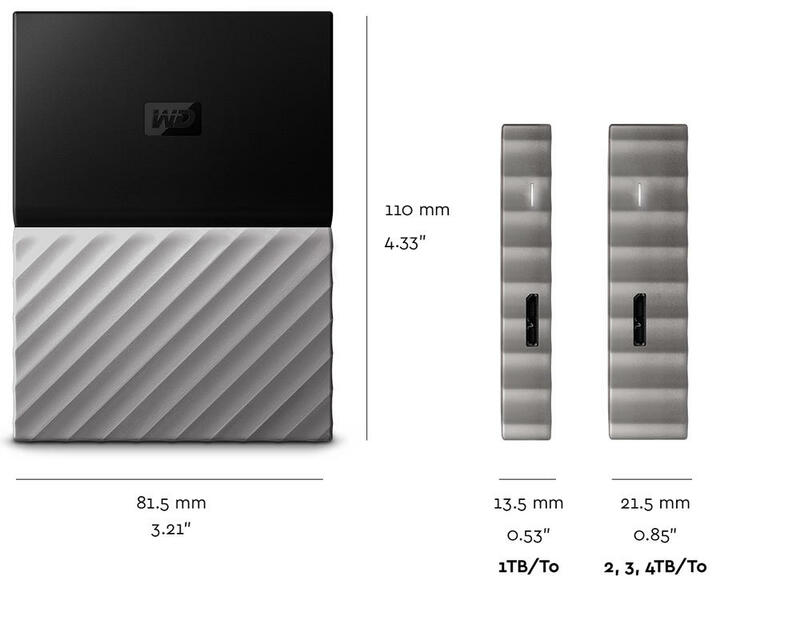 Still at the minimal sizing of just 81.5mm x 110mm and available in 4TB, 3TB, 2TB and 1TB the drive is small enough to be carried discreetly in a handbag or laptop bag. The drive also includes the standard USB 3.0 / USB 2.0 interface which you’d expect for a drive of it’s type. However don’t let that fool you as the drive is far from a standard portable hard drive. This time round the WD team have considered the social media implications of transferring your data, and so have a fantastic piece of kit included with the Ultra drive. ‘WD Discovery’ connects the My Passport Ultra Drive to popular social networks and cloud storage services including Facebook, Dropbox and many others. This means you can instantly import your photos, videos and docs to your drive and have peace of mind that your online data is stored on a tangible piece of reliable kit. Another great feature is the drive’s ‘WD Security’ software built into the hardware. This security software which has 256-bit AES hardware encryption ensures your files are kept safe from unwanted attention. Simply set your own custom password, activate WD’s sophisticated WD security software and you’ll have the peace of mind that your files are locked away and only accessible by your own password. The system itself was remarkably easy to set up and we were very impressed with the protection it offered our files. Especially knowing they’d at risk being transported between systems. On top of WD Discovery, the My Passport Ultra drive comes with WD Backup software a fantastic addition which means your files are automatically backed up from your machine at your own convenience. By simply choosing a time and frequency of backup you’re safe in the knowledge that your files are automatically backing onto this incredibly discreet machine. We were especially impressed with this piece of software, and with a storage device so small it was easy to forget that your files were quietly being backed up whilst you were working.